Picked up this beauty today for $150.00 with the box and an extended sports band. Still has Apple Care left on it too. I have been looking for a nice used one and happened to be in the right place and the right time. Found it at a local estate sale. munichblue, AppleKarma, JML5150 and 3 others like this. You're using the same watch face I have on my Watch 2 (with a different color scheme), and the same weather app. Dark Sky is the only one that accurately predicted snowfall totals in our neck of the woods. Congrats on the nice watch, you’ve had a couple good days! What a great deal that is and amazing find! Enjoy your Series 2. I can’t get myself to buy a watch like this yet. I’m a traditional watch person, especially mechanical. I can’t imagine having to charge a watch. But for those that do, these are the way to go. bakron1 and nikkisharif like this. If it weren't for fitness-tracking, I wouldn't have one either. But the Watch has replaced my Polar running watch, heart rate strap and foot pod, as well as my Fitbit. Convergence FTW! I totally get it. Especially competitively. I just do things like lots of stairs at work to keep my cardiovascular health intact. Walk, eat right. Don’t need a watch for that. I know where your coming from, I wore a Stainless Rolex Submariner since 1978 and even had a all gold one for a few years. Sold them in 2010 because I found myself not wearing them much. Only decided on the Apple Watch because I am a heart patient now and I like the health app and the heartbeat function on the watch and the technology is pretty cool. It is cool what they can do, no doubt. Eventually they’ll be able to tell your blood sugar, blood pressure and how many calories you’re consuming. Never had a Sub, most of mine are German made; Sinn, Archimede, Stowa, etc. I just appreciate the mechanisms and hand made cases. For you and your health I think you made the right choice. I also had a couple of Sinn and Stowa watches over the years, nicely made watches. I am also an avid photographer and loved Leica cameras and actually went to the Leica plant in Germany while I was over there on business. Congrats on your new Apple Watch, it looks great! Apple Watch has definitely raised my awareness level of how much I am (or am not, lol) working out. bakron1 and djrakowski like this. So how often do you have to charge these? Congrats on your find...looks amazing!!! I put it on the charger while I’m getting ready for work (after the gym) and while I’m sleeping, but I suspect it would last 2 days. It depletes much more rapidly if I’ve used GPS (during races and outdoor training runs a few times each week during race season). Mmm. If they get these batteries to last 7 days or so I might bite. I think that’s true for lots of folks. I don’t find it terribly inconvenient to charge it every day, though. I’m already charging my phone and iPad, and the Watch is even easier to manage as it just drops onto a magnetized inductive charging dock. I think it’s more mental than anything. While I’m used to charging a smartphone, I’m used to putting my watch on and just leaving it on without worrying about it. Nothing difficult, just habit. Congrats! 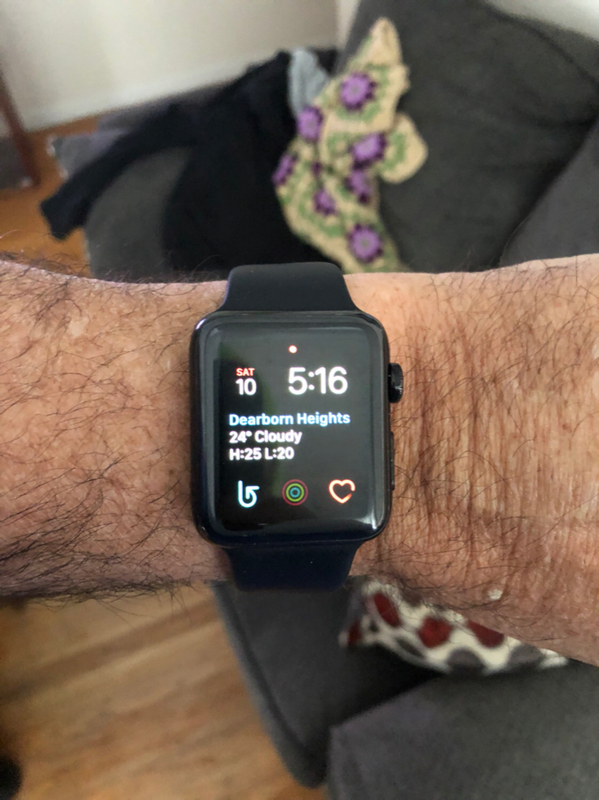 I've been wanting to switch from fitbit to an Watch now that they are working on trying to track heart stuff like AFib with it (which I got diagnosed with at the young age of 43 a couple years ago). I really want a stainless but I'm disappointed you have to pay extra for the cell band that I don't care at all about in order to get it. I didn't think about looking for a refurb/used series 2 though. I usually always have my phone so no built in GPS wouldn't really be a huge issue for me. Heck of a deal! Congrats! I'm going to go ahead and put you in the "will never own an Apple watch" group. Going from a 2 day charge to a 7 day charge is going to take re-writing the laws of physics or a once in a lifetime change in battery capacity.